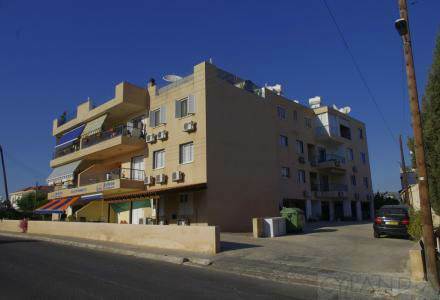 Cyprus Property Blog by Cleo : Paphos Town Apartment - 3 Bedrooms - Great LOW Price!! Paphos Town, Paphos - Living in Paphos Heights provides quality living and the ease of living in town. The home is 2km from Paphos city centre and equal distance to the beach and tourist area of Kato Paphos. Within 10 minutes walking distance you’ll find all services and amenities. From Debenhams, bakeries, pharmacies, beauty salons, clothing boutiques to a state of the art primary school and one of the best private clinics in Paphos are all within easy access of this convenient apartment. The home is in the desirable southeastern corner of the block, offering 109sqm of living space. The apartment is tastefully decorated and well maintained. The well appointed separate kitchen has ample storage and workspace with balcony and views to Tsada hills. The 29ft length dining room/lounge leads to the covered balcony, with views of the sea and beyond looking east towards the airport. The home is smart-wired throughout, combining phone and fax lines, Satellite TV, computer and internet connections and dimmer lights. Reverse-cycle A/C provides all year comfort, the block-out roller blinds help keep your home cool even in the height of summer. An electrically powered awning on the living room balcony gives you instant privacy and shade enabling you to enjoy the amazing panorama beyond with no effort whatsoever. Quiet, convenient and very cozy – an apartment with all the trimmings of home. Please refer to MLS#: 1107 when inquiring.